Sushi may be the perfect healthy dining option. Cut into six or eight pieces, a typical sushi roll is not only delicious, but free of added fat, loaded with beneficial vitamins and minerals, and packed with protein. Here are a few reasons why sushi is good for you and some suggestions on which rolls you should order. While each roll of sushi has a different calorie count, there are a few smarter choices you can make when ordering. To keep the calorie-count low, avoid deep-fried crunchy rolls, mayo-based sushi, and drowning your sushi in additional sauces. For an even healthier boost, try sushi rolled in brown rice instead of white. Brown rice is rich in fiber and won’t raise your blood sugar levels as much as white rice. Common sushi ingredients such as fish and shrimp are high sources of protein. Some rolls can provide as much as 13g of protein. 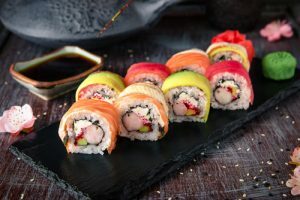 Other protein-rich seafood is used to make nigiri — paired pieces of rolled rice topped with wasabi and a variety of toppings. These toppings range from shrimp, eel, scallops, tuna, salmon, to octopus. The fish most commonly found in sushi rolls (tuna, mackerel, and salmon) are high in omega-3. These fatty acids are believed to improve mental abilities and memory function. Also, the high concentration of fish oil found in sushi can greatly improve cardiovascular health. Nori, the type of seaweed used to wrap sushi is a great source of minerals and antioxidants such as zinc, iron, and vitamins K and B. The B12 vitamin converts our food into glucose to give us energy. Seaweed also contains iodine which helps regulate thyroid functions such as metabolism and mood. Read more about the health benefits of seaweed here. The health benefits of sushi don’t necessarily stop when your meal ends. After you’ve finished your satisfying meal, cleanse your palate with the accompanying ginger left on your plate and walk out with glowing, healthy skin courtesy of its anti-inflammatory and healing antioxidants. Enjoy your healthy sushi meal at the best Orlando Japanese Steakhouse on International Drive, call us today at 407-352-1607 or reserve your table online.